John Harker joined the Territorial Force in 1912, and served throughout the First World War as a signaller with the 1/6th Glosters. 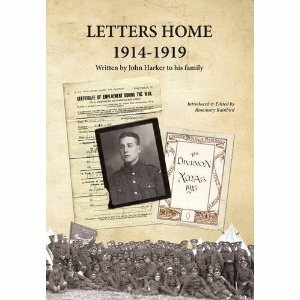 This book brings together the postcards and letters he sent home, lovingly kept by his Grandfather. Wary of the censor, not much is given away in the letters. John talks of being under artillery fire, conditions in the trenches, the weather, and how difficult it was for people back home to understand what it was like. Letters and parcels from home including supplies of cigarettes, food, and warm clothing are welcomed. The general progress of the war is commented on and it is interesting to note a hint of ‘war-weariness’ that becomes apparent towards the end of 1917. Serving in France and Belgium, John saw out the end of the war in Italy. The letters stop in February 1919 when John is waiting to be demobilised and planning his post-war life, having made it through the war unscathed. Of as much interest as the content of the postcards are the images from the front of them, reproduced in their entirety. The pictures show a mixture of billets, destroyed churches and buildings, and also include postcards from the Daily Mail series and handmade silk cards. Appendices include John’s demobilisation documents, newspaper clippings, some of John’s post-war reminisces (for example about courses he attended), and information about the Gloucestershire Regiment. Whilst the collection is not groundbreaking in its content, in its simplicity it provides an insight into the life of an average soldier, his thoughts and experiences, and the importance that receiving correspondence from home played in making life in the trenches bearable.